We can’t all be Henry Ford. Market analysis is a must. Some people have a knack for developing products that people love, regardless of what the market says. Take Henry Ford and his famous quote about faster horses. This type of uncalculated success is still possible, but less likely. Today’s markets are flooded with new product innovations. In order to succeed, most new products will need to address a market need or void. A brand must conduct a market analysis for a new product that uncovers gaps in the competitive landscape. To do this, brands must listen to and engage with the market continuously. It’s the best way to avoid expensive product development mistakes that can cost a brand its reputation. Markets shift with Political, Economic and Sociocultural and Technological changes, which is why a common format for market analysis is just that: PEST. The PEST Analysis format analyzes the external factors that are out of a brand’s control and can create opportunities or threats to a new product. It can help a brand decide whether to enter, remain in, or leave a market. A SWOT Analysis (Strengths, Weaknesses, Opportunities, Threats) can be conducted by businesses looking to introduce a new product to the market. The first two components help them analyze their own strengths and weaknesses while the second two are external factors. From there, the business must assess whether their strengths can accommodate for opportunities in the marketplace. Whether conducting a market analysis using the PEST, SWOT or Porter’s Five Forces methodology, accurate, reliable data is needed to make informed decisions. The sources of this data can vary based on the breadth, cost and accuracy you’re seeking. They can range from census information to research firms. None of that is new, but here’s what is: product reviews. You may not think of product reviews as a data source for market analysis. In fact, most brands look at reviews as nothing more than a platform for shoppers to connect and make informed buying decisions. But there’s gold in the insights that are uncovered when these reviews are aggregated. And today’s most innovative brands are mining them to make consumer-centric decisions. An analysis of the double walled plastic mug market using product reviews uncovers a weak product in the market. Once this trend is discovered, product reviews can then be used to reveal specifics about what consumers liked and disliked. In this case, the weak product was the only one with a flip top lid, but the lid was leaky. They already exist. The first benefit of using product reviews in your market analysis is that they already exist. Even if your product or industry is nascent, you can still glean market information from the post-purchase experience of people who have used similar products. When one Channel Signal customer was looking to get into a new market segment, they did a competitive product analysis to better understand the segment. Even after they’ve entered the market, they continue to monitor the competitive landscape to make informed product decisions. They are highly targeted. Panel surveys claim to reach a targeted audience based on a number of criteria. And they do a pretty good job. But it’s difficult to get a wide swath of respondents that have purchased specific products you’re looking to measure. The right partner can help you aggregate product reviews for the exact product set you want. It can be targeted right down to the specific materials, colors or product editions you care about. They reveal your competitors’ strengths and weaknesses. As can be seen in the graph above, sometimes weak products are glaringly obvious. In order to know why purchasers of the product hated it, or which elements they hated, you can drill deeper into the review set. This can reveal competitive weaknesses that can be seized upon. They help monitor new entrants to the market. If they are up and coming brands in your space and you feel they may be encroaching on some of your market share, it’s easy to add them to your product review analysis platform set. They allow you to know what customers want, in their words. We’ve seen it time and time again. Product reviews can uncover facts about your customers and what they want. These facts are often counterintuitive to the brand. For example, one fashion brand was pushing a pump as a perfect pair with skirts, but reviewers constantly praised how well they went with pants. They allow you to do all of this quickly. The right partner can help you aggregate reviews historically. Going back 1 or 2 years is a great way to get a large data set quickly so that reliable decisions can be made. Markets are ever-changing. And while product reviews make it easy to gather historical information, ongoing analysis is key to successfully utilizing this data source for the betterment of a business. New product editions, releases that disrupt the market and seasonality have an effect on the consumers’ opinion in your competitive space. Any consumer-focused product company will want to aggregate product reviews as a business data source. 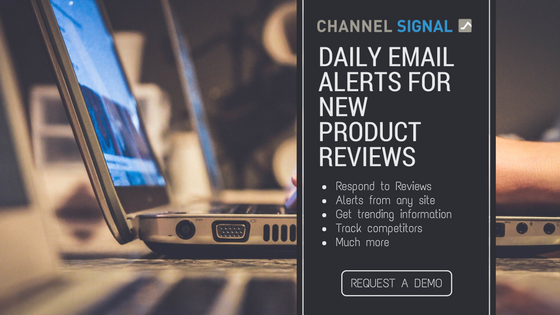 Channel Signal partners with brands in many industries to help them understand global buyer experience for their entire competitive landscape.